Part of the show Are Dogs Ticklish? Richard - I'm wading across a water meadow just on the outskirts of Oxford. I can see the spires in the distance behind me. The river is somewhere in front of me and I'm not quite sure where the meadow stops and the water starts. I'm being quite careful. Richard - Kate Griffiths from the British Geological Survey. Kate - In order to get our sample, we need to first pump out the surface water from around them and then we attach a sort of pipe that enables us to make sure that we're only really sampling the ground water, so we're not getting any interference from the surface water. Richard - The measuring equipment is all contained in a wheelbarrow, but given that there's water everywhere, I asked Dan Lapworth how they even found the well sampling points. Dan - One of the problems at this site is that they have to be concealed because there are horses that graze this area. So, on top of each well, we place a piece of metal. So we effectively have to find them using a metal detector. Once we've found them, we're then able to take a sample as Kate has described and there's a whole range of different samples that we're taking. Some to look at the water quality, the water chemistry, some to look at how old the water is to try and date the water, and some to look at the organic carbon in the water to get an idea of the different types of organic carbon that are in the water. Richard - And there are multiple sites across this meadow? Dan - There are. It's a transect running at one side near to a landfill, across the meadow, towards the river Thames. So it's a series of three nests of wells and there are two transects that run across the meadow. Richard - Kate, you're looking at what happens to the water as it goes across. The effects of the meadow on that water underground. Kate - Yeah, that's right. I mean, flood plains are very active and dynamic environments, so we've got lots of different types of water (we can see some here...). There's ground water under our feet obviously, and there's a lot of mixing going on in this area. We've got sources of water coming from the river gravels that form the city of Oxford, so that's a sort of urban input coming into the meadow, and then we've also got a lot of interaction with the river itself. So, as well as the physical mixing of all these waters, we also got lots of bio-geochemical processes associated with that. We expect these to change spacially and also with time. So seasonally, we'll see changes in the chemistry as water levels rise and fall, and we also see the influence of factors such as Dan mentioned this old domestic landfill which is situated to our left there, and that has its own chemical signature which we can pick up as we monitor. Richard - I noticed in the mud that standing still is a mistake. Richard - Because I'm likely to lose a welly, so let me just move around a little bit. Why do this research? What are you looking for? 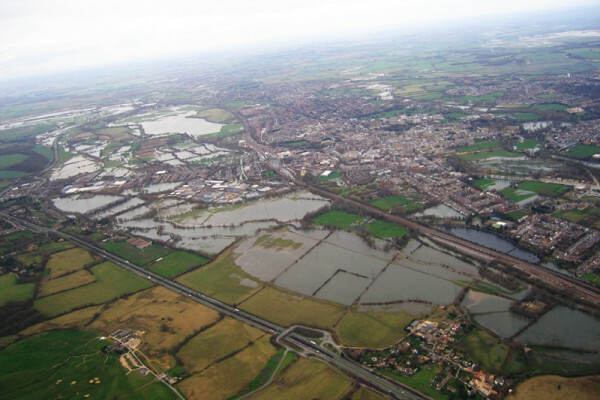 Kate - The bigger picture really is that these flood plain environments, there's a lot of them across the country and they're under increasing pressure as our urban areas move out towards the flood plains and even on to the flood plains. You can see over there in the distance, the houses are virtually onto the flood plains. So, we want to try and understand what role the flood plain can have in trying to reduce pollutants coming from these urban areas and getting towards the surface water over there which is the river Thames. Obviously, this is applicable to lots of other situations in the UK. A lot of our big rivers have lots of urban areas on their flood plains. So the Thames, the Trent and Mersey for example. Richard - Dan, you've got a pump operating here and it's pulling up some of the water, into a little beaker. Richard - Looks pretty clean to me. Fundamentally, is it quite clean water? Dan - It's been moving through the ground water, the rocks beneath us, which are actually sands and gravels. As it moves through that, it's actually being filtered as it moves, so the water you can see is relatively clean compared to the lake water that we're standing in, but it still does have lots of dissolved constituents in it. I wouldn't perhaps want to drink it. Richard - You wouldn't drink that? Dan - No and it's also probably, there are lots of microbes in it as well. So, it's probably unsafe to drink but it looks very clean. Kat - That was Dan Lapworth and Kate Griffiths from the British Geological Survey talking to Planet Earth podcast presenter Richard Hollingham.